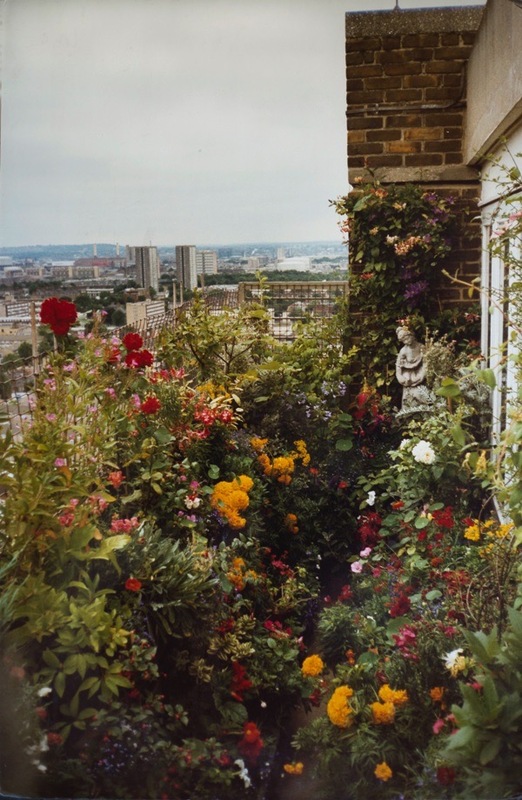 Like the princess in the tower, at ninety-one years old Hester Mallin is confined to her flat on the top floor of a tall block off the Roman Rd in Bow, where I had the privilege of visiting and hearing her story. From this lofty height, Hester contemplates the expanse of her time in the East End. Born to parents who escaped Russia early in the last century, Hester spent the greater part of her life in Stepney, where she grew up in the close Jewish community that once inhabited the narrow streets surrounding Hessel St.
Of independent mind and down-to-earth nature, Hester took control of her destiny at thirteen and has plotted her own path through life ever since. 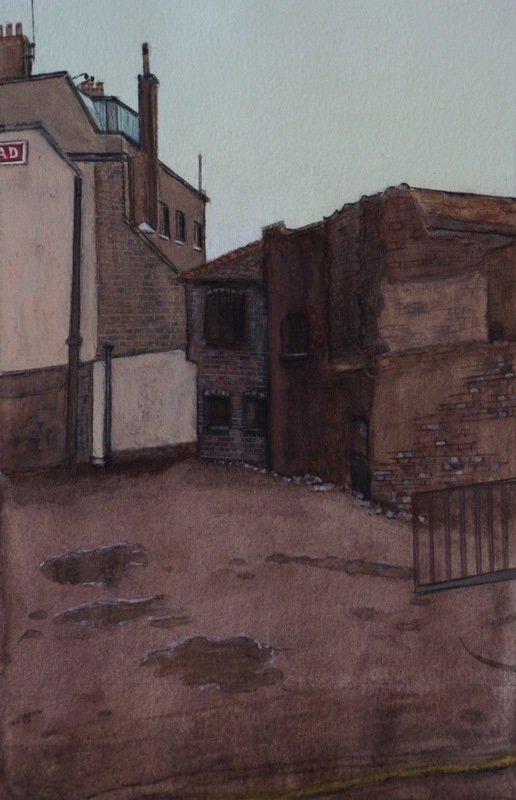 When the Stepney streets where her parents’ sought their existence emptied as residents left to seek better housing in the suburbs and demolition followed, Hester could not bear to see this landscape – which had such intense personal meaning – being erased. So she began to photograph it. Decades later, when her photographs were all that remained, Hester transformed these images, coloured by memory, into the haunting, austere paintings you see here. 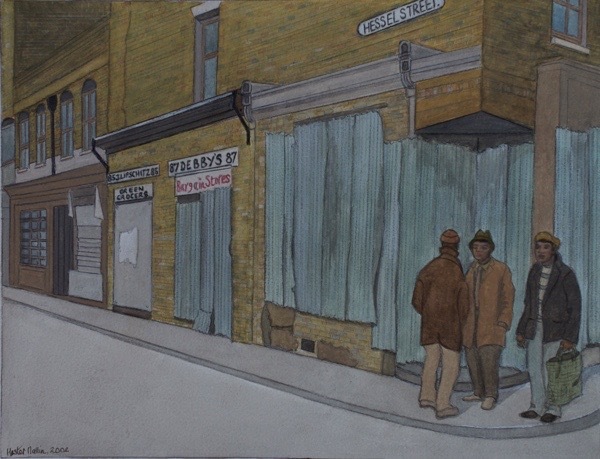 Of deceptive simplicity, these finely wrought watercolours of subtly-toned hues are emotionally charged images for Hester. 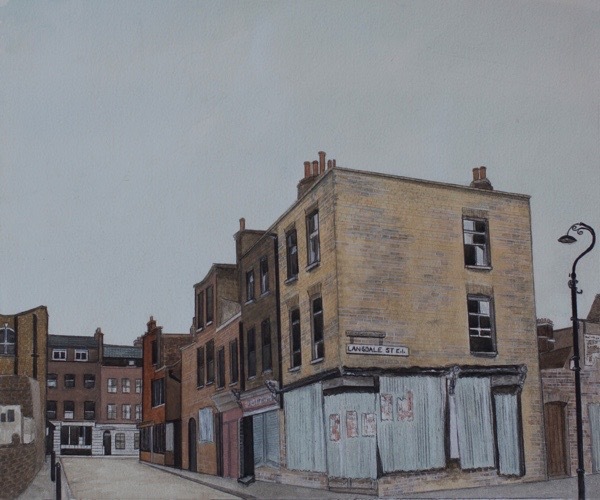 Even if the streets and buildings are gone and even if Hester can never go back to her childhood territory, she has these paintings. Today, she keeps them safely beside her bed to cherish as the only record of the place which contains her parents’ lives, their community and their world, which have now all gone completely. 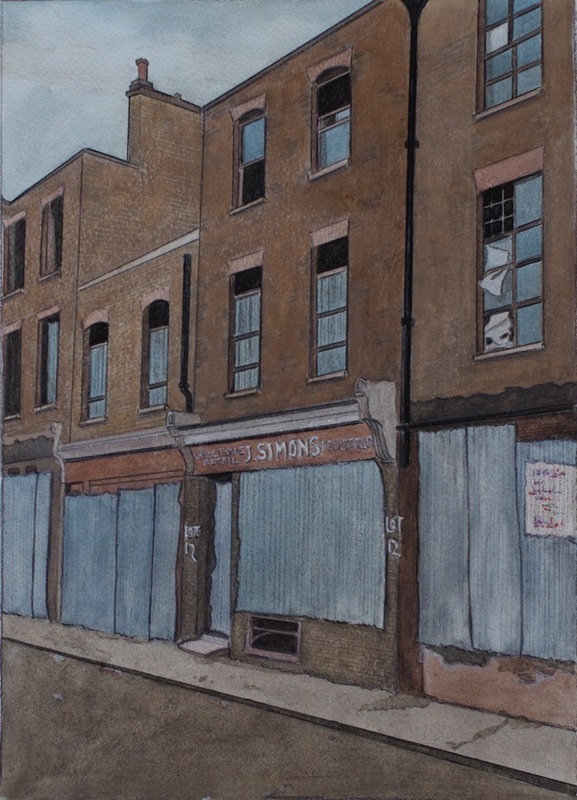 Yet in spite of her remarkable life and resources of creativity, Hester modestly considers herself a ‘typical East Ender’ – as she confided to me recently. What great pictures, and a lovely garden. 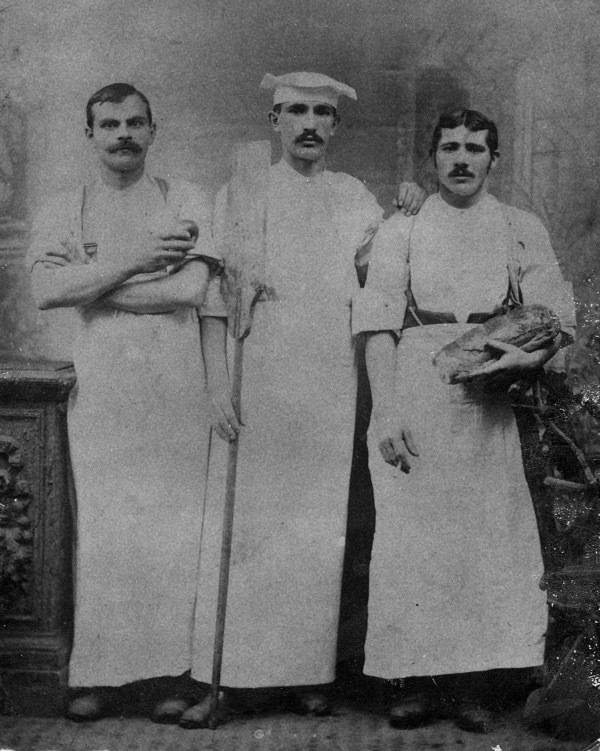 There was a BBC programme about victorian bakers working overnight shifts in basements. Unbelievably hard work. Thanks for this fascinating story. Best wishes to Hester. A wonderful story, albeit sad, but altogether human. Lovely paintings. thank you. Yet another example of wonderful social history from the area, painstakingly curated by The Gentle Author… ‘Ordinary’ people often have the most interesting stories, as does Miss Mallin. What an inspirational lady and a life well lived. 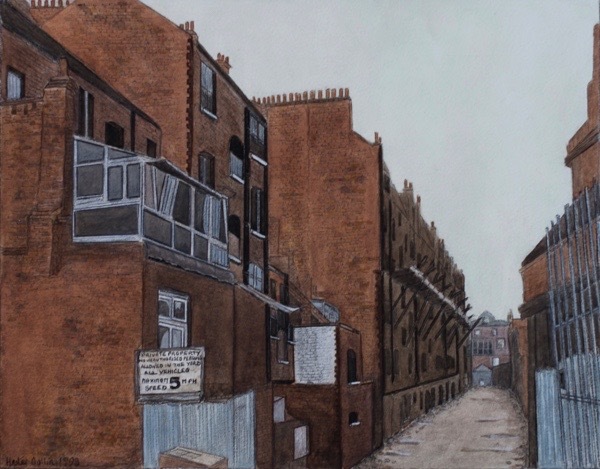 I knew about Hester’s fame as a gifted high-rise gardener in the 90s but had no idea she created these haunting, evocative paintings. I hope we get to see an exhibition of them in the near future. For some reason the ‘M. Strongwater’ painting moves me more strongly than the rest (though they’re all impressive). Miss Mallin’s mother’s story moved me deeply. What a terrible thing, to be sent to a strange land, alone, at that age. 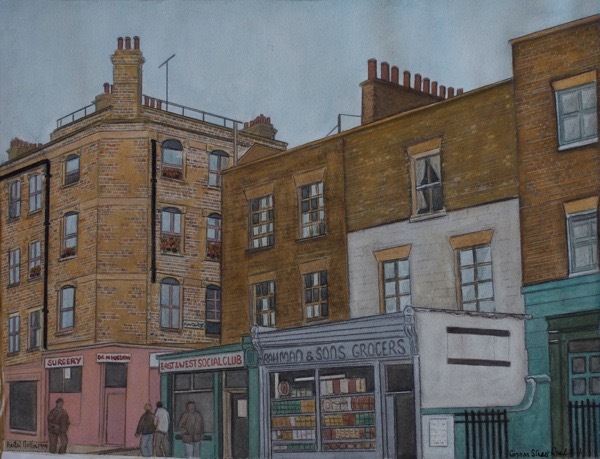 “Rear of Morgan Houses”…….I find myself totally THERE at this moment. I hear my own solitary footsteps down this narrow passage, heading for the distant opening, wondering what is ahead. scaly bricks…..and then I am caught up in the mood of the place. Ms. Mallin is an incredible, vibrant discovery. Many thanks for shining a light. GA, what an inspiring story of Hester Mallin who found fulfillment in life through her own creativity and resourcefulness. I can hardly believe that this is the first time Hester’s work has been shown. What an extraordinary body of work. I would love to see Hester’s photographs. 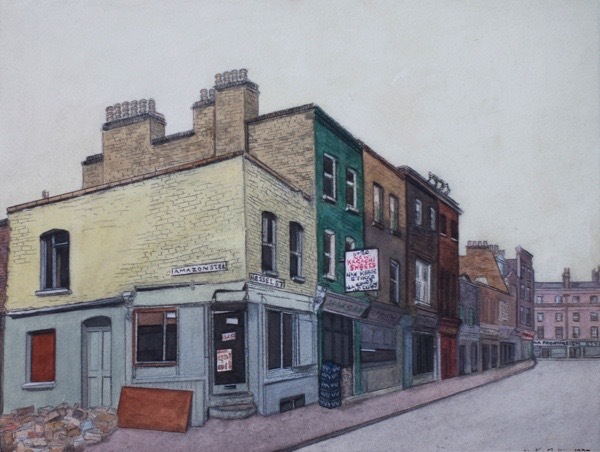 I remember Hester well she use to be a regular visitor to my shop in Roman Road she was working as a librarian at the end of her working life, a well educated and very smart woman. The last time that she visited my shop her health was failing, I am delighted that she is still with us. She made no mention of her artistic talents when conversing, her work is exceptional. I wish you well Hester. Thank you for bringing another East End artist to our attention, GA. I’m so proud when I read of people who although they grew up in adversity persevere and are self taught and follow their dreams. To 120, Hester Mallin. 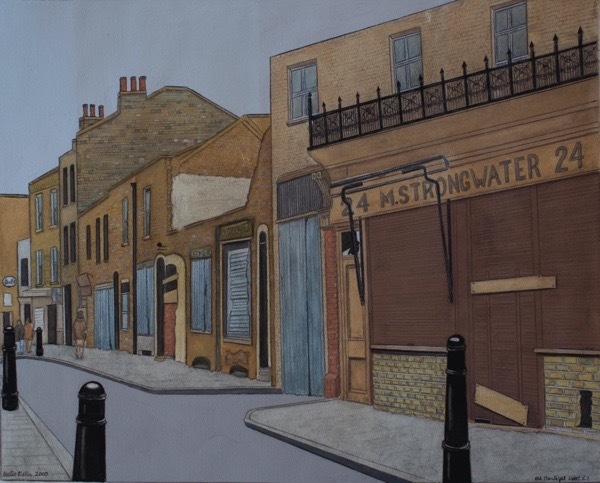 One of my cousins has just sent me a link to this wonderful article about our Aunt Hester Mallin and I’m writing to thank you for this amazing interview and enabling her to talk about her life in Stepney. It’s a surprise that she agreed to speak about things which are so personal and it’s certainly filled in many gaps for me. Aunt Hester was always a talented and unusual woman, very independent and courageous, and the article has touched us, her family, very deeply. It’s the first time that I’ve seen some of her paintings which are exceptionally good. Most of her family live abroad and stay in weekly phone contact from afar. A few of us are the children of Hester’s older half-brothers, her father’s children from his first marriage which she didn’t mention in the interview. Only one cousin still lives in the London area and he and his wife visit her regularly. It’s far from being ideal but we care very deeply for her and appreciate that she has been able to express herself via this fascinating Blog. It’s also lovely to read the warm comments. Many thanks for the wonderful article! The paintings are very moving. They capture personal memories. What an interesting lady Hester is. 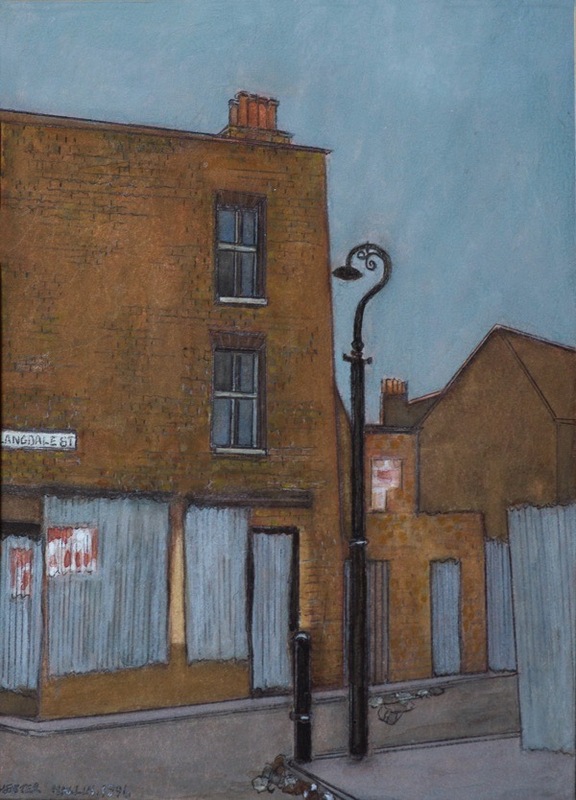 I find these paintings extraordinarily powerful in their intensity of vision, lack of sentimentality and their evocation of a whole once-teeming world bound by a few abandoned streets. They are a testimony to the human spirit’s ability to rise above unworthy housing conditions and much suffering to create better lives. 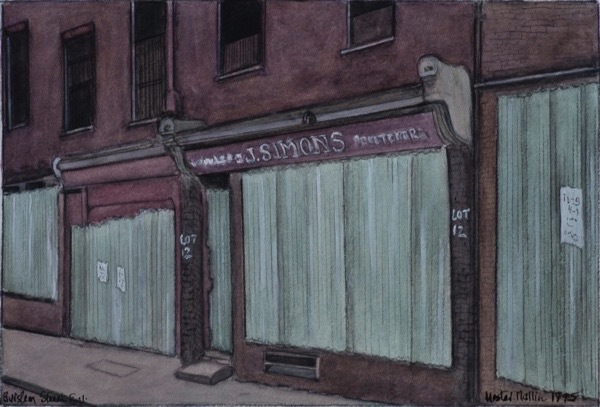 I remember Hessel Street in its last gas-flickering years and the network of streets that was its hinterland. I too would love to see Hester’s photographs, as well as an exhibition of her work. And that 23rd-storey balcony garden is just wonderful! One of the most beautiful story blogs I have ever read & seen. What an amazing and inspiring story despite the sad events running through it. 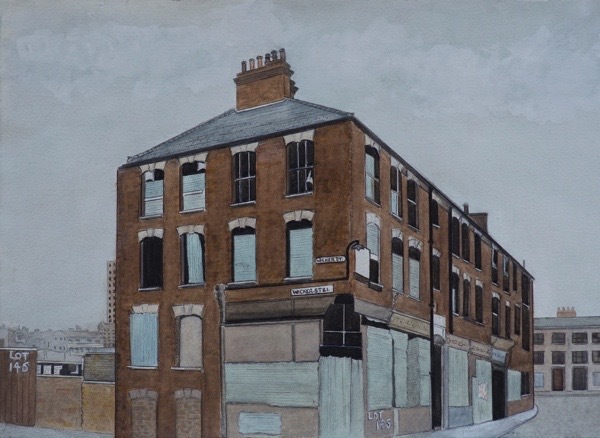 I love the paintings, where Hester has created beauty in dereliction. They are truly wonderful. I was pleased to learn that she rose above the contempt of that horrible and cruel teacher in her early life after showing her talent for art, but so sad that Hester was subjected to such treatment. It must have been so frightening and bewildering. We live in a cruel world, but it sounds as if Hester created beauty on every path she trod, later with her gardening. A talented and special lady who I wish well. Thank you for this wonderful blog. 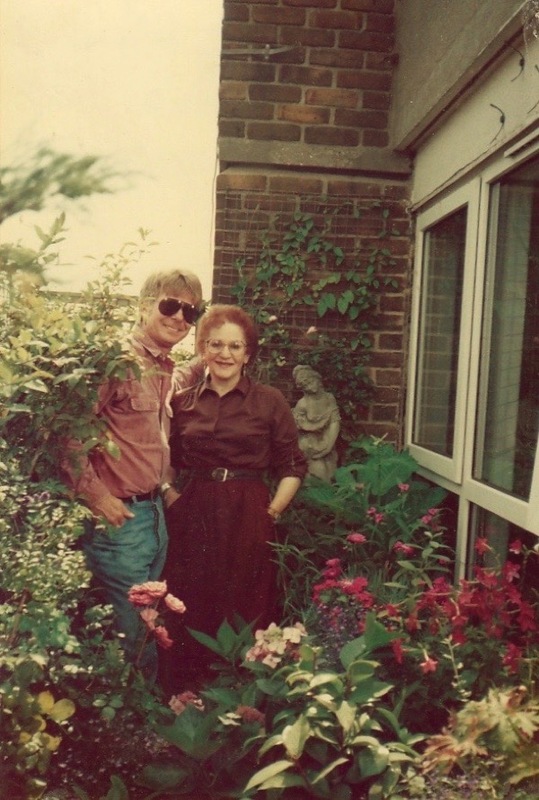 Loved reading this inspiring story ..love your paintings hester..also your beautiful garden..i lived in Langdale mansions during the 60s..so the paintings brought back lots of memories ..thank you.